Spectrum Industries has been the leader in cart manufacturing since 1995. We are known for building mobile device carts that will last through many deployments of technology. Take a look at the great line of carts we have developed to securely store and charge your devices. The Cloud Series is our #1 selling series of carts. Our redesigned Cloud Series carts are able to store, charge, and transport either 32 or 40 Chromebooks (up to 14”) with the option of adding our intuitive PowerProdigy™ charger. Originally made to hold notebooks and laptops, the Pro Series of carts has also become popular with Chromebooks since the cart will hold any size device. The overhead wire management allows the charging plugs to hang in front of each device. Simplify your life without breaking your budget. 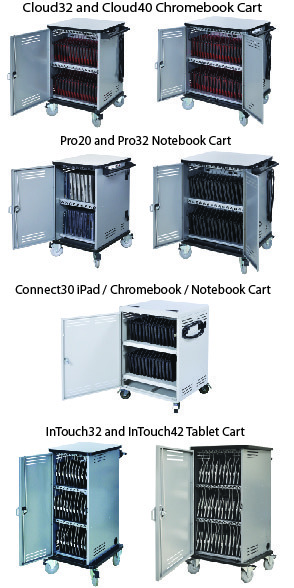 The Connect30 Cart is a rugged and reliable cart at an outstanding value and is highly versatile with optional features which allow it to manage most tablets, notebooks, laptops, and Chromebooks. Built specifically for storing and charging tablets, the InTouch series is compatible with devices from nearly all manufactures. The InTouch32 is the smallest footprint in the industry while the InTouch42 has all the same features, but is perfect for your larger classroom. The quality of a Spectrum cart is unsurpassed by any other. From convenient wire management to easy rolling deluxe wheels, you’ll love all the features we have to offer. All our carts are UL-60950-1 ETL recognized and designed and assembled in Chippewa Falls, WI.